Custom paint and is fully chromed. 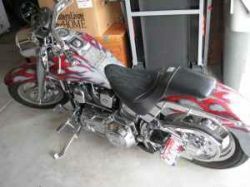 I got married and need to buy a bagger for myself and the wife so the 1998 Harley Fatboy has to go. It's in excellent condition, located in Boise Idaho and you can make an appointment to come see it. Just leave your contact information in the space below provided by Strike Lightning for listing Used Harley Davidson Motorcycles for Sale and I will get back with you as soon as possible. Strike Lightning would also encourage bikers to submit a review of the 1998 Harley Davidson Custom Fatboy to help potential buyers make informed decisions and to benefit the biker community as a whole. I have tried to offer the Harley Fatboy for sale for a price that's what I believe it is worth and am now ready to just let it go for a steal at $13,500.00!